Description: this Dilophosaurus is electronic and sports a biting action. When pulling the left arm back the mouth opens and produces two short identical screeches which in no way resemble the rattling and hissing sounds this creature made in the movie. Most noticeably, this figure is equipped with a big frill, largely round in shape with serrated edges. The frill can be placed around the creature’s neck, making it look more aggressive and dangerous than it looks without. It can also be applied to various other figures, though more for fun than for realism. Like any good Dilophosaurus figure, this sculpt sports the same double crest with small spikes behind on its head. The creature stands in a largely neutral posture, though its tail is raised upwards. It has some trouble standing on its two legs since it’s not very well balanced, but making it lean on its tail in a tripod position solves that particular problem and makes it look more dominating. This Spitter sports a fairly simple paint job despite the ample colouring possibilities the frill and crests offer. The lower parts of the sculpt (belly, most of the flanks, arms, feet, most of the legs, lower part of the tail and portions of the head, including the inward parts of the crests) are all light grey, while the rest of the figure (the back, upper part of the tail, the front sides of the upper legs, the neck and the area around the eyes) is dark green. Green shapes run out of this colouring over the flanks and sides of the tail and neck. Hardly noticeable, lighter green colouring runs around the edges of the darker shade of green on most of its body. Most of the lower jaw and throat are purple. The inside of the figure's mouth is also purple, including the tongue, while it has small white eyes with black irises and tiny white teeth. Its claws are not painted in a different colour. On its left upper leg it carries a black JP logo. The frill is also grey and is covered with green around the edges on both sides, including the aforementioned lighter green hue, as well as purple stripes and small lighter green spots on the front side. This dinosaur comes with three pieces of capture gear. The first part is the standard tag which fits around various body parts. The second piece restrains both the arms and legs simultaneously, while the third piece covers the head, including its crests. All three pieces are painted in the same shiny metallic grey paint job. Analysis: the classic Electronic Dilophosaurus from the very first JP toy line from 1993 also returns for the first JP: Dinosaurs line. Unfortunately, there's nothing this figure adds to the already existing sculpt. Both the paint job and paint scheme are largely identical to its predecessor, though the original white has been replaced with grey and this new release sports a darker paint job overall. Even the colour schemes on the crests and frill are practically the same, which is a real shame because body accessories like these provide great opportunities for wild colouration try-outs, but apparently no designer rose to this challenge. The only notable difference is the back of the frill, which also has coloured edges now. Furthermore, some details have been omitted, like the claws on both hands and feet, but the inside of the mouth at least is painted. The sound FX have been beefed up a few notches and sound more impressive than before. However, for some reason the mouth won't open as far as before, making for a less effective attack action. It could just be my particular specimen, but the feeling is raised that the designers tampered with its strike feature when improving the electronics. 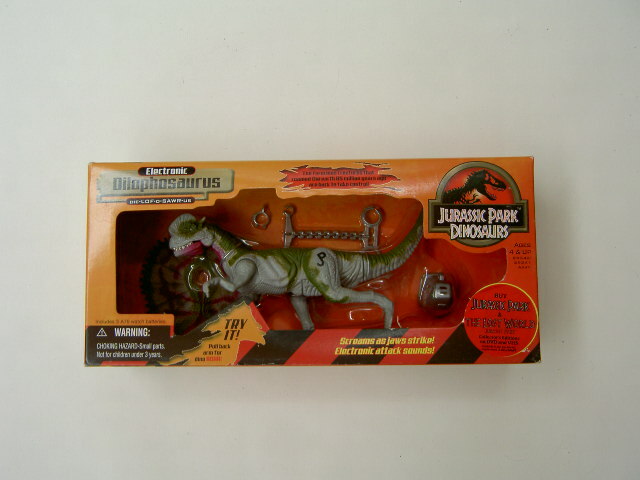 Unlike the original JPS1 Electronic Dilophosaurus, this figure comes with capture gear. None of the three pieces were designed for it of course, but at least they fit. The limb piece works pretty well and does an adequate job of restraining arms and legs. The head piece is a near perfect fit, which is especially interesting knowing this particular part also comes with the Dimetrodon and Ornithosuchus figures of this toy line: it seems to be a fairly universal muzzle. The tag is just the standard little nuisance, the sort of thing people keep misplacing, severely irritating collectors who aim to get the figure complete when in loose condition, all the while not providing any real function but to tell people this is a Jurassic Park figure, which of course everybody can see by the JP logo on the figure's left leg. Repaint: yes. This is a repaint of the old JPS1 Electronic Dilophosaurus, with repainted capture gear from the JPS2 Velociraptor and TLWS2 Ornithosuchus figures, as well as the typical tag found on many dinosaur figures from various JP toy lines. The figure would not be repainted again. Overall rating: 6/10. It's still a fairly decent Dilophosaurus sculpt with greatly enhanced sound FX and usable capture gear, but the paint job is just a terribly big let-down and the attack option has lost its impact. This is one of the more common electronic dinosaurs from this line, but still not always an easy find, especially MIB or complete.